One of the requirements of my International Diploma in Crochet is a written report. 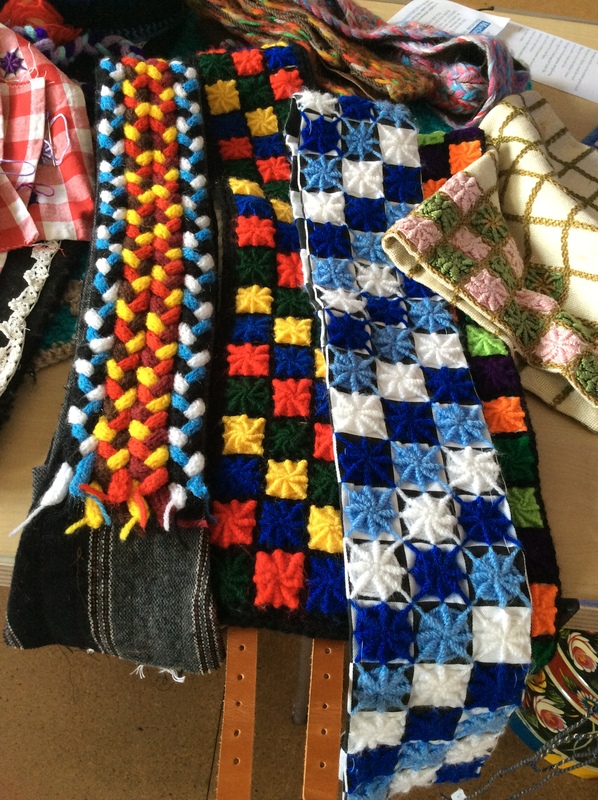 I have opted to research how much evidence of crochet – items, implements or patterns – exists in our local museums. Over the past few weeks I have discovered that plenty of such items exist but, and it’s a big BUT, almost all of them are packed away in archives. If you want to see any of the above examples you have to make an appointment with an archivist and the waiting list can be as long as three months. By the time I contacted the third of my list of local museums I was becoming quite frustrated by this state of affairs ……. as are some the ladies in the Boaters’ Crafts Group who told me of this sad situation when I enquired about canal crochet exhibits at The National Waterways Museum in Gloucester. The group is made up of men and women who, having realised how little is on display to inform the public about the lives and crafts of the families who lived on the waterways, meet regularly at The National Waterways Museum. Their aim is to demonstrate and raise awareness of the domestic crafts practised by the boat people. They also give talks locally to spread the word and, hopefully, inspire others to explore these 19th century crafts. 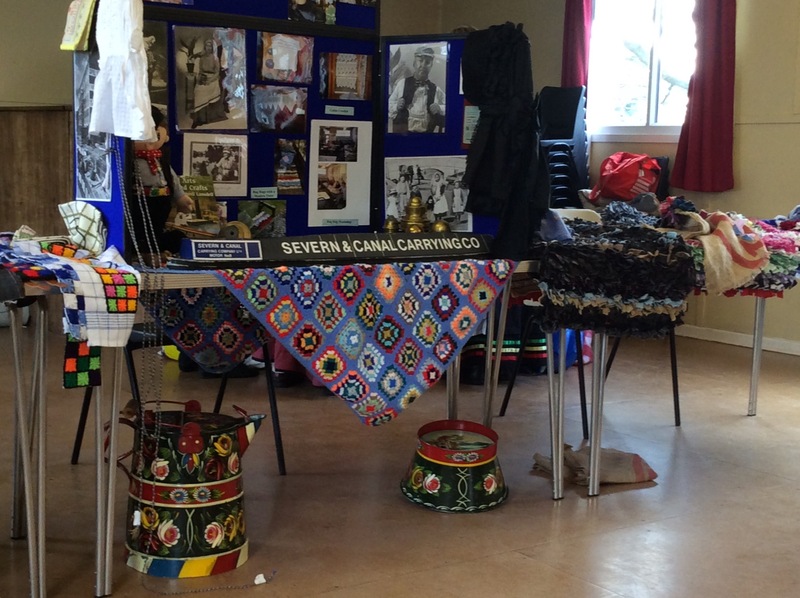 I was fortunate enough to attend one such talk where there was a display of canal crochet and other items used and made by the boat people. 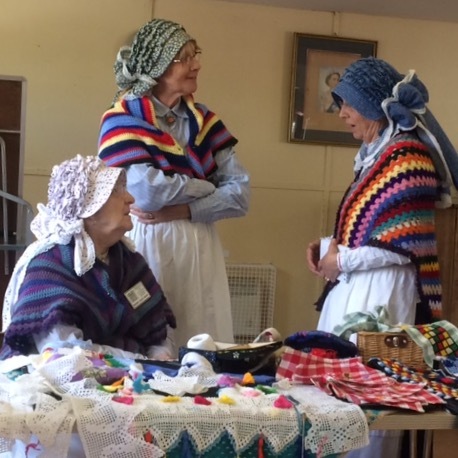 The ladies who gave the talk were all colourfully dressed in typical boat women’s wear, made by themselves. Their crocheted shawls reflect the style and bright shades which were popular amongst the boatwomen. The decorative, but sturdy, bonnets add colour and feminine detail to the otherwise plain, utilitarian outfits of these hard working women while at the same time protecting their heads from the cold, the rain and the sun. 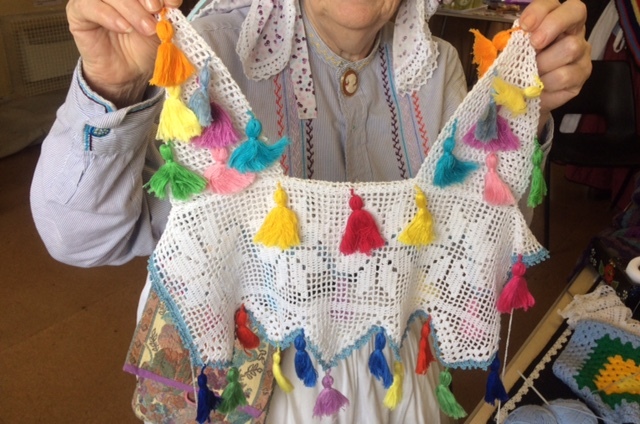 Crochet was the most popular craft of the boatwomen. The very fine filet style of the canal crochet is being reproduced in the Boaters’ Craft Group by a very talented lady affectionately referred to as their “crochet queen”. She was taught the technique many years ago by a neighbour whose mother was, in fact, a boatwoman herself. 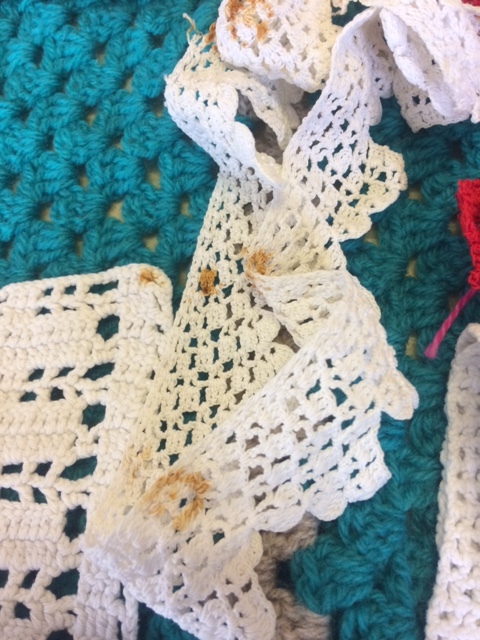 During the talk the crochet queen demonstrated her skill and spoke of her aim: to teach present day crafters to make canal lace as beautiful as that which was being crocheted on a daily basis by the boatwomen. They decorated the interiors of their cabins with shelf edgings …. …. curtains and porthole covers. 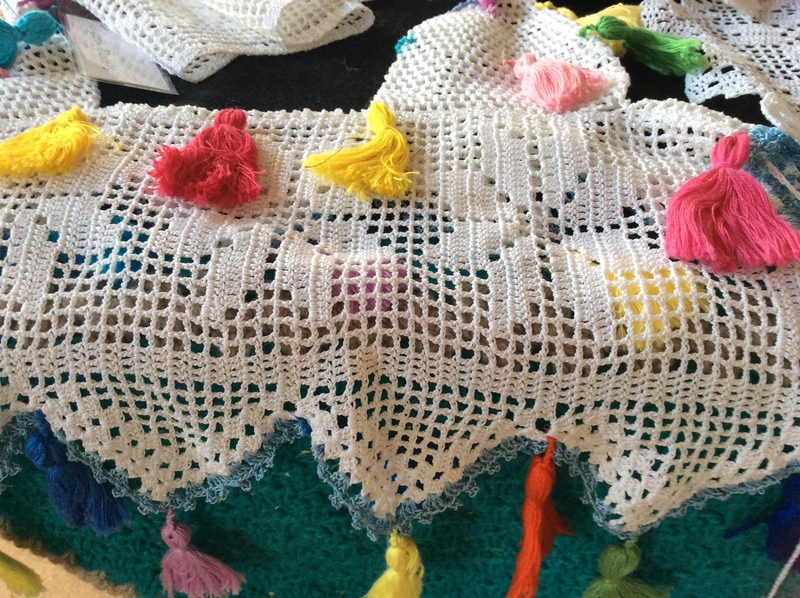 They made yards and yards of crocheted lace edgings to embellish their bonnets, aprons and girls’ dresses. One of the most beautiful items on display at the talk was a horse’s earcap – a protective covering worn by the canal folk’s horse’s to keep the flies away from their faces and eyes. The swishing of the coloured tassels would keep away insects …. There was embroidery on display as well – gorgeous coloured belts in intricate spiderweb stitches worked on tea towels or other squared material. The talk was both fascinating and informative. I was totally unaware of the extent and importance of canal crochet; my attempts at filet work have now taken on a whole new meaning and I am keen to try some of the original cabin lace designs. How brilliant that this group of crafts people are passionate enough to give up their time and share their enthusiasm with the general public while museums do not seem to believe there is a need to display exhibits of such historical importance. On that note, let me wish you all a very happy Easter. 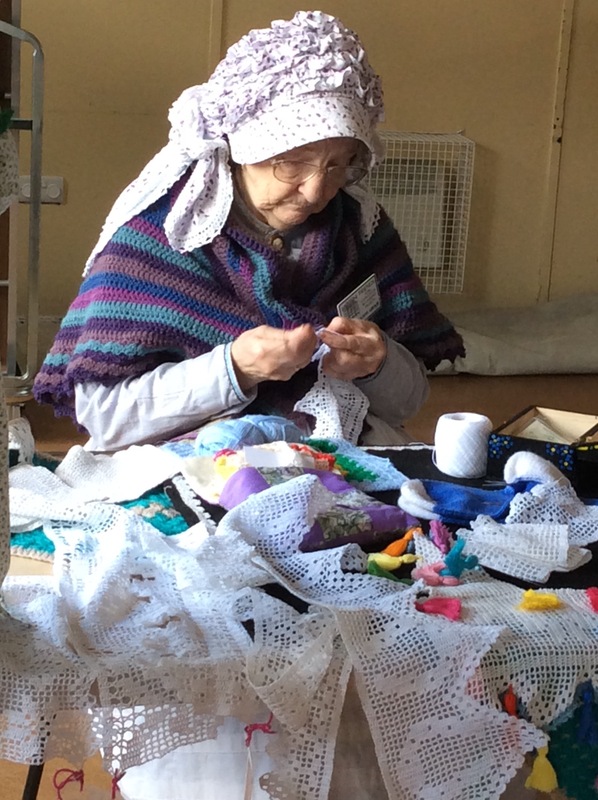 I hope you have time for a bit of crochet …… or knitting …..or embroidery – in fact, whichever craft inspires you.